Work on the bright new future of a Northumberland attraction is underway. Construction to transform the dilapidated Brigantium roundhouse at Rochester into a star attraction for village activities began last month. The site will become home to an open air amphitheatre and contemporary timber pavilion to be used for stargazing, musical performances, and a range of community workshops. It is being developed by students from Newcastle University’s School of Architecture, in partnership with Kielder Water & Forest Park Development Trust’s Art & Architecture programme, as part of their Testing Ground project. The project is an ongoing collaboration between the two groups to create public facing architectural commissions and activities, and this latest development follows the success of the Stargazing Pavilion constructed at Stonehaugh in 2014, and The Warm Room on Kielder’s community campsite in 2015, by similar groups of students. Peter Sharpe, Kielder Art & Architecture curator, said: “I’m delighted that we’ve been able to continue our partnership work with the university students. “Together we’re developing unique and publicly accessible structures that really bring to life one of the areas best assets – its dark skies. “The roundhouse at Rochester had fallen into a state of disrepair, but following a period of consultation with local residents, we’re now working on adapting and adding to the original structure and its immediate site, transforming it into a unique, usable space for village activities. The roof of the existing stone circle has been removed to turn it into an open-air amphitheatre style space and local craftsmen have carried out repairs to the dry stone wall, before adding new seating and flooring. Work is well underway on the timber pavilion, which is located next to the stone circle and will include a sedum green roof. The landscaped site will also create a secondary usable outdoor space, which will be run by the community under a booking system, so fencing will be introduced to the boundary and a gate installed to control access. The project is expected to be complete by the end of May. Graham Farmer, Director of Architecture at Newcastle University, said: “The opportunity to work with a rural community has proven once again to be an invaluable experience for the students. “In the process they have gained numerous transferable skills, from dealing with statutory bodies, to managing time and costs, as well as the significant challenge of having to construct one of their own designs. 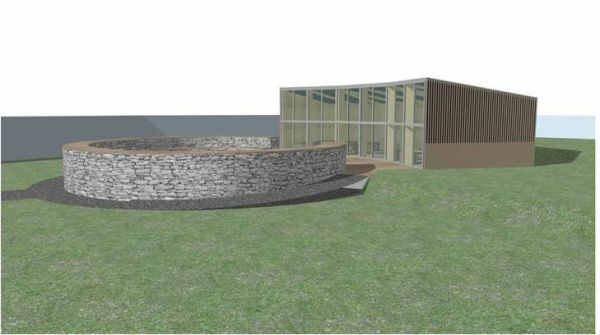 Emma Kellie, Vice Chair of Rochester Village Hall, said: “This project has given the community in Redesdale a fantastic opportunity to discuss ideas for positive community events, workshops and stargazing evenings to take place at the rejuvenated roundhouse site. The Rochester Roundhouse is being delivered with support from Newcastle University, Arts Council England, Sir James Knott Trust, Northumberland County Council’s Community Chest and Northumberland National Park Small Grants scheme.